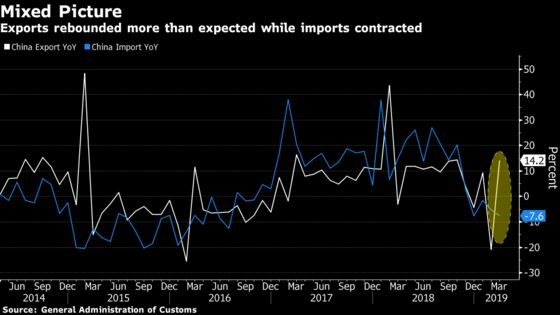 (Bloomberg) -- China’s exports rebounded after the Lunar New Year holiday amid a pickup in trade talks optimism, while a continued slide in imports underscored the fragility of the domestic economy. Exports jumped 14.2 percent in March from a year earlier while imports fell 7.6 percent in dollar terms, the customs administration said Friday. That left a trade surplus of $32.65 billion, with the bilateral surplus with the U.S. rising to $20.5 billion in the month from $14.7 billion in February. China’s more upbeat sales abroad are a tentative sign of resilience in the global economy amid further signs of trade tensions, though the data would have been heavily influenced by seasonal and price factors. The continued slump in imports though suggests a bumpy road ahead for the domestic economy as it seeks a rebound from a bruising few quarters. Data published shortly after the trade numbers showed credit growth also rose more than expected in March, a positive sign for the recovery. Aggregate financing was 2.86 trillion yuan ($426 billion) last month, compared with about 700 billion yuan in February, the People’s Bank of China said Friday. The median estimate was 1.85 trillion yuan in a Bloomberg survey. "Stimulus efforts are bearing fruit," said Katrina Ell, an economist with Moody’s Analytics in Sydney. "We expect to see a broader pick up in activity taking place from the June quarter." The yield on China’s 10-year government bonds extended its increase after the data was released, rising 6 basis points to 3.34 percent, the highest level this year. Futures contracts on the notes slid for the first time in three days. The moves indicate traders are pricing in stronger risk appetite and less monetary easing. The Lunar New Year fell in 2019 in early February instead of mid-February in 2018, which likely aided March year-on-year comparisons. Big fluctuations in January to March trade data are mostly due to the Chinese New Year holiday, Customs Administration spokesman Li Kuiwen said at a briefing in Beijing. “Relatively low” growth is due to uncertainties in global demand, he said. Banks including Goldman Sachs Group Inc., Morgan Stanley and HSBC Holdings Plc are increasingly confident that the world’s second-biggest economy is finding its feet after a rocky start to the year. Corporate tax cuts, an upswing in manufacturing and expected progress on a U.S. trade deal are among the factors buoying optimism. The latest round of trade talks -- which Trump hailed as a “big success” -- further fueled optimism even as a final deal is not assured yet. U.S. and Chinese negotiators are discussing adding a concession on cloud computing to their trade agreement that would give foreign companies greater access to the $12 billion Chinese market, Bloomberg News reported, citing people familiar with the talks. Still, the persistence of the nation’s import slump is worrying some analysts, who also say the strength of exports is largely the result of holiday distortions.